Migrants sit on mattresses laid on the floor at a detention centre, located on the outskirts of Tripoli, Libya, Wednesday 1 February 2017. 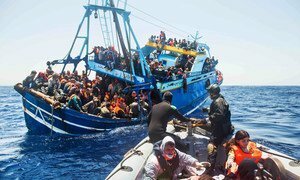 That appeal coincided with a call from the UN Refugee Agency, UNHCR, to boost search and rescue facilities in the region, amid concerns about a toughening stance in some European Union (EU) countries, against volunteer boats disembarking people plucked from the water. Speaking to journalists in Geneva, IOM’s Leonard Doyle explained that Ambassador Swing had made a personal appeal to Libya’s Prime Minister, Fayez al-Sarraj. On this third official visit since 2016 to the North African nation, which is a major migrant hub, Ambassador Swing also met some of those in detention. Of more than 50 detention centres in operation last year in Libya, only 17 are still open, Mr Doyle explained, adding that the bulk of migration happened in and around Tripoli, where the internationally recognized Government is located. Concerning the management of the detention centres, in which the UN Human Rights Office, OHCHR, has highlighted grave rights abuses in the past, Doyle said there is “government oversight” in some, “but it is far from comprehensive”. He added that when Ambassador Swing had met the Libyan Prime Minister, he had recommended the construction of separate centres for women and children. The development follows a sharp increase in Libyan anti-smuggling operations in 2018, backed by the EU. Last month alone, almost 4,000 people were rescued in the country’s territorial waters, IOM said in a statement, noting with concern that migrants are placed in detention, often in overcrowded and poorly-monitored centres. Also in Geneva, UNHCR spokesperson Charlie Yaxley highlighted concern over the high number of vulnerable people who continue to perish in the Mediterranean Sea. For the fifth year in a row, more than 1,000 people are dead or missing, he said, while nearly 48,000 asylum-seekers and migrants have reached Europe’s shores in the first six months of 2018 – five times lower than in 2016, when arrivals peaked in the EU. The high loss of life illustrates the need to strengthen search and rescue at sea, Mr Yaxley insisted, reiterating that the “key, key priority has to be saving lives at sea” and preventing people from “putting their lives in the hands of smugglers and taking these often-fatal journeys”. Between January and April, non-governmental organisations have been responsible for around 40 per cent of rescue operations for those disembarked in Italy, UNHCR said in a statement. And amid a recent decision by Italy to refuse docking rights to vessels carrying migrants, the agency reiterated the potentially fatal impact, if boats are discouraged from responding to distress calls. “If we have any threats of legal action or the hint of repercussions of hanging over boats rescuing people at sea, then the very principle itself will potentially come under risk” Yaxley said. “You may see ship masters wavering over responding to distress calls and that is a dire situation not only for migrants and refugees, but for anyone who is in distress at sea,” he added. More than 200 migrants have drowned in the Mediterranean in the past three days, bringing the overall death toll so far this year to more than 1,000, the International Organization for Migration (IOM) reported on Monday. 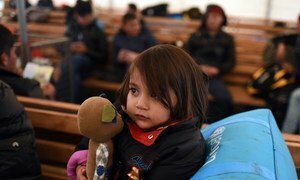 UN humanitarian agencies on Friday broadly welcomed a freshly-inked deal on migration by European Union leaders which calls for more Member States to take responsibility within their borders for those in need of protection, amid a hardening stance by some since 2015.